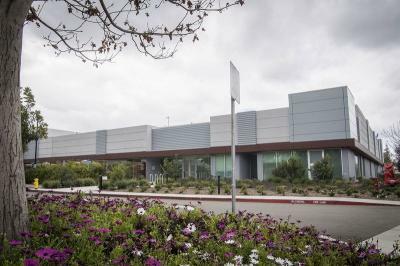 Apple, one of the world's largest companies, develops consumer electronics and computer software, and the company also develops a wide range of next generation technologies. In 2014 Apple acquired LuxVue Technology, a startup company that developed Micro-LED based displays. LuxVuew raised $43 million in funding prior to the Apple purchase. Apple continues to researcn and develop Micro-LED technologies and established a research and production facility in Taoyuan, Taiwan. 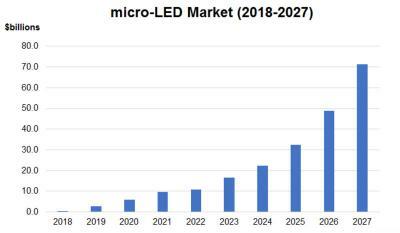 in 2017 reports suggested that Apple intends to start low-volume production of Micro-LED devices by the end of the year, with mass production commencing in 2018 (in-house or at production partners, which makes more sense). 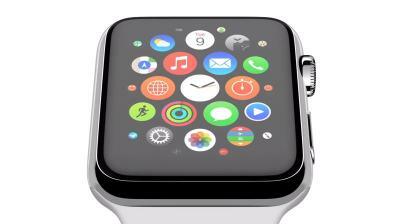 Apple's first goal is to adopt Micro-LED displays in smart watch devices. According to a report by Bloomberg, Apple is making good progress in its Micro-LED development project, and has managed to produce promising display samples. 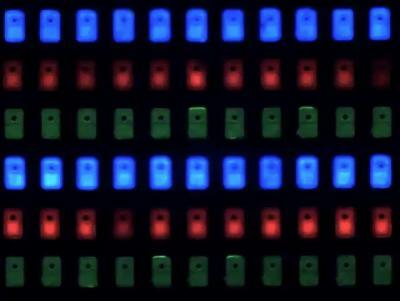 Apple is seeking to use Micro-LED displays in future wearable products. Apple is not likely to become a MicroLED producer, and it will seek partners to eventually produce the displays. However controlling the basic technology could be very beneficial to Apple that aims to be the only company able to use Micro-LED displays - starting in wearables, but also perhaps in smartphones and VR HMDs. In any case, Bloomberg reports that it will still take a few years before Apple's technology is ready for production. 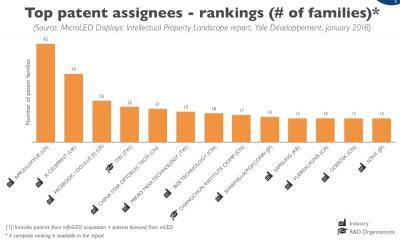 Yole Developpement published an interesting article discussing the patent landscape of the MicroLED industry. As of today, almost 1,500 MicroLED patents were filed by 125 companies and organization. The overall corpus has an average of 3.2 years, which makes these patents quite new. The initial micro-LED patents, filed at around 2000-2001, were mostly by a variety of research institutes, by large companies such as Sony and Sharp but also by startups such as Luxvue (acquired by Apple). The activity in this field is still led mostly by startups, and with the exception of Sony and Sharp, mature display makers are relative latecomers.